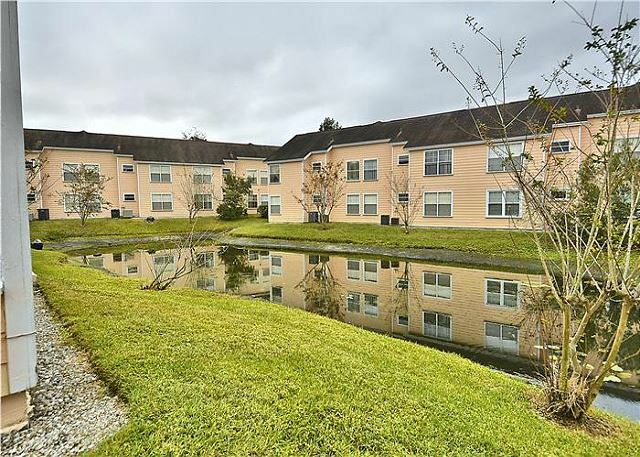 This excellent condo is situated in the Villas at Somerset resort, just south of the 192 on North Poinciana Blvd, less than 15 car minutes from Walt Disney World. 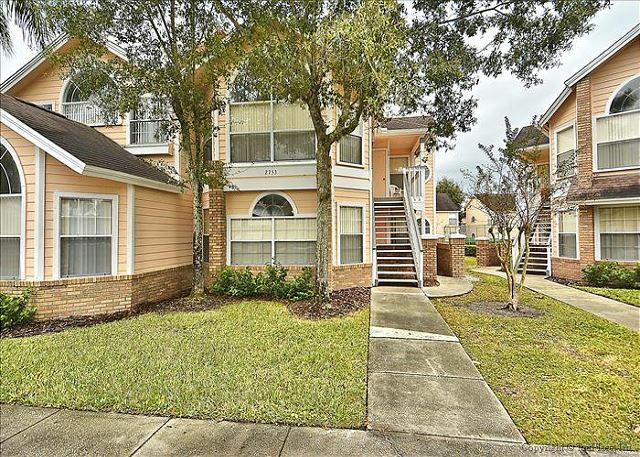 With the Interstate 4 (I4) within 3 miles of this condo, Universal Studios (25 minutes), Seaworld (20 minutes) and Legoland (45 minutes) are all within easy reach, just like the beaches on the Gulf of Mexico (90 minutes). This condo offers free high-speed internet (Wi-Fi). 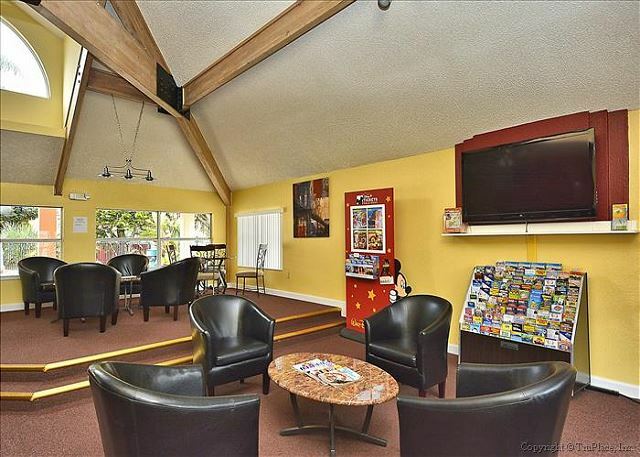 The condo has many extras to make your stay enjoyable. It has been furnished to a very good standard. 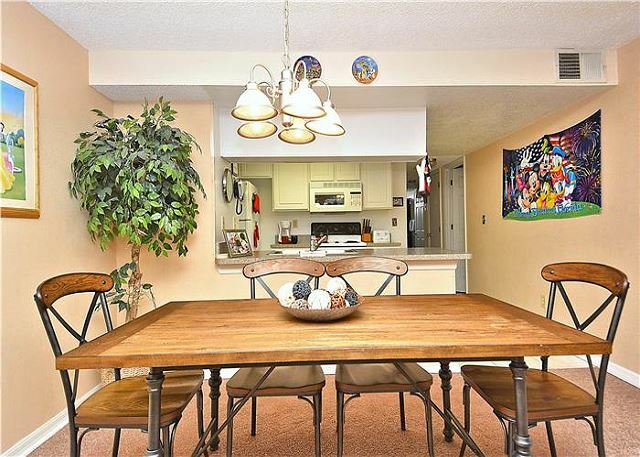 The great floor plan places the fully equipped kitchen right in the middle of the family room, dining room and 3 bedrooms. 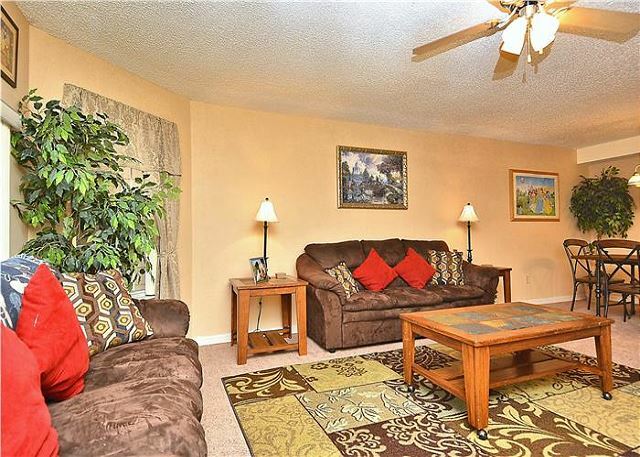 Upon entering the condo, there is the very spacious family room with cable TV and DVD player to the left, with the dining table (seats 6) right next to it. 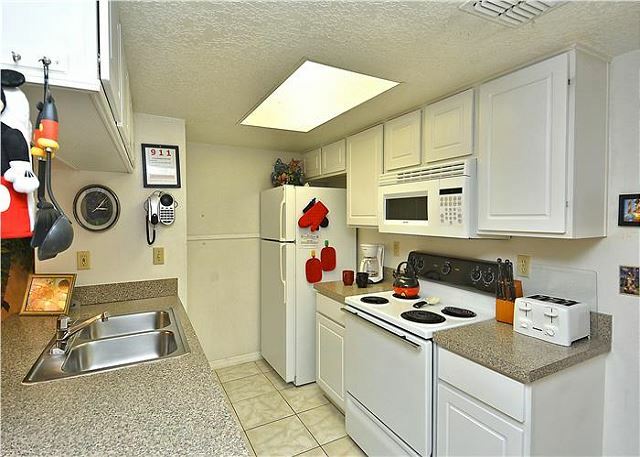 The well fitted kitchen is located to the right. Past the kitchen is the hallway leading to all the bedrooms and bathrooms. The kitchen includes a full size oven, built-in microwave, fridge-freezer with ice-maker, waste disposal unit and dishwasher. There is also a full range of electrical appliances and utensils – everything you could want in your home away from home. 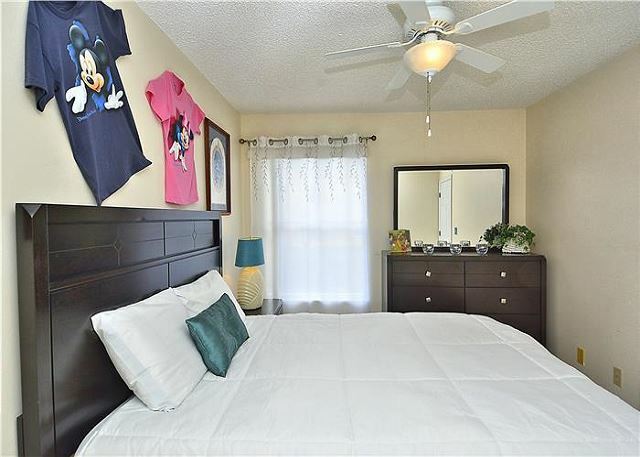 The Master bedroom has a Queen size bed and cable TV with DVD player, plus an en suite bathroom offering vanity, large walk-in shower and toilet. 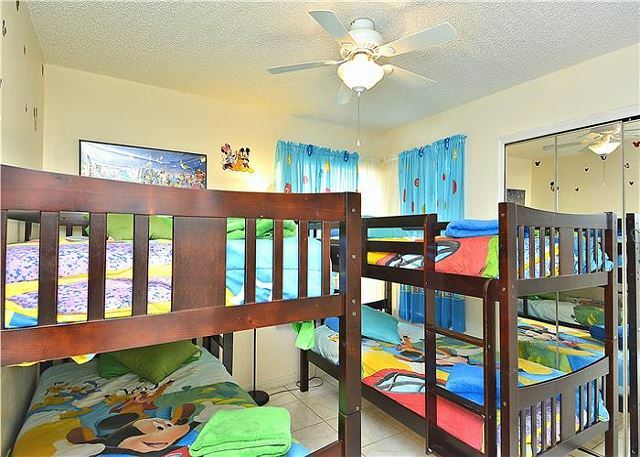 The second bedroom features 2 Bunk beds (sleeping 4 total). 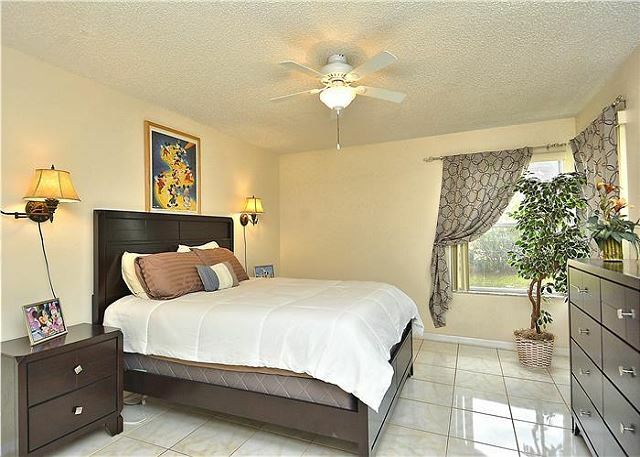 The third bedroom features another Queen bed, with flat screen TV. 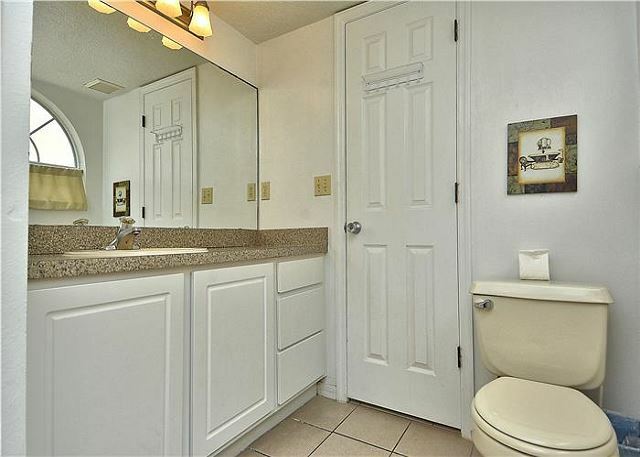 These last two bedrooms share the second bathroom, accessible from the hallway, with shower tub, vanity and toilet. 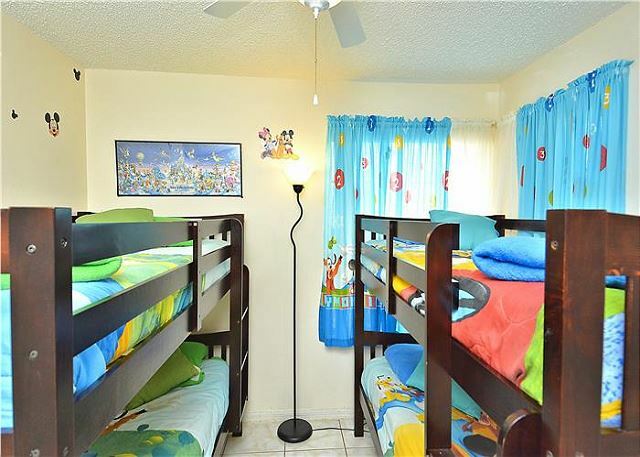 All 3 bedrooms have plenty of closet space and each has a ceiling fan too (in addition to the central air conditioning). 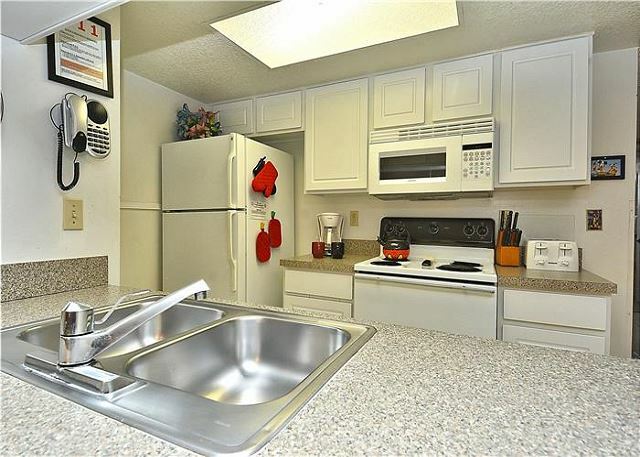 The washing machine and dryer are located in the laundry closet found in the hallway past the kitchen. Iron and ironing board are present too. On the resort, a host of amenities help make your stay even more enjoyable. There is the large resort pool (heated in fall and winter) and the resort Spa/hot tub (heated year round). 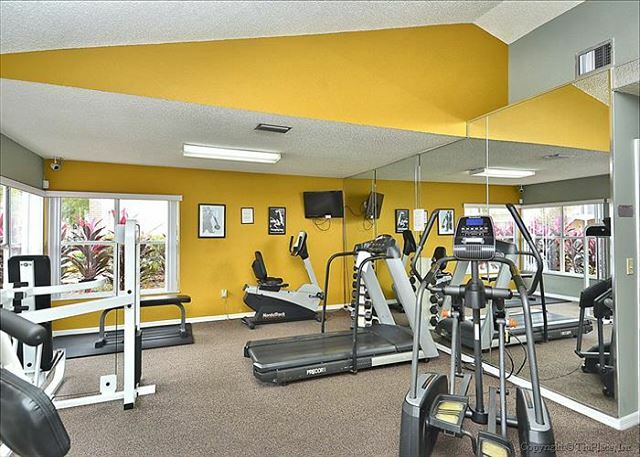 You also enjoy complimentary access to the resort’s gym, sauna, tennis court and the Clubhouse (open 24/7) with business center and gift/convenience shop. As Excellent Vacation Homes is the local management company looking after this property 365 days a year, any technical or other issue is usually prevented before it even gets a chance to develop. But, our 24-hour cover service is always available should you require it during your stay. 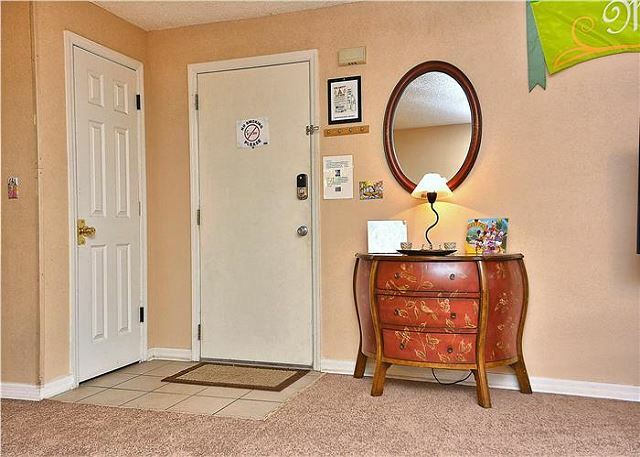 The condo is fully air conditioned for those very hot days and has reverse air for those colder days. Line above states within 3 miles from Disney World. I don't think that is correct. With that being said, truly enjoy this condo. Already booked for next winter. 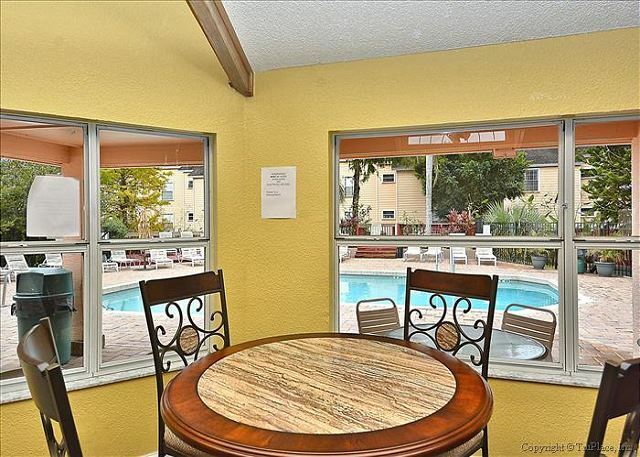 It is centrally located for all the Orlando entertainment. Highly recommend this vacation rental. Excellent stay as always. 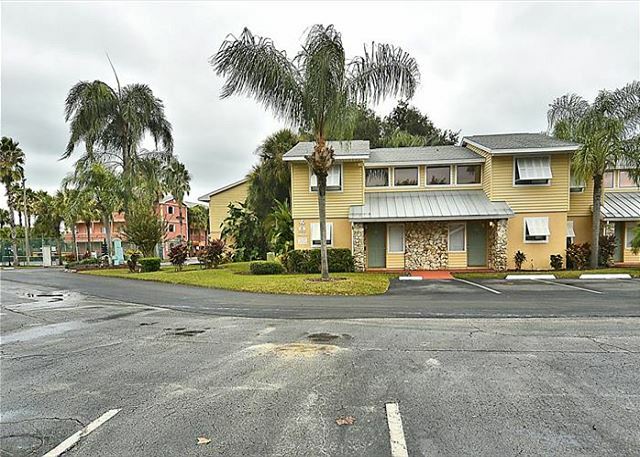 Great location for the Disney Parks and other area attractions. Kris at Excellent Vacation Homes is very helpful. See you in January 2019. Dear Connie, always a pleasure to welcome you back! Thank you for an excellent review and we're happy you have booked for 2019!! Enjoyed my stay very much. Enjoyed a lot of Disney which is nearby. Already booked for next year. Only suggestion would be to replace the iron and ironing board. Hi Connie, thank you for this great review and feedback. Glad you enjoyed your stay at this Excellent Vacation Home and look forward to welcoming you next year! We stayed here for a week in mid-March and loved it! There was plenty of space for our family of 6 and the touches of Disney everywhere were great. My husbands favorite part was the door lock because we didn't need to worry about keeping track of anything! Thank you Mariah for an excellent review. Glad you enjoyed this wonderful condo. Yes, the keyless access door code is an easy process and takes away the worry of losing the key. We look forward to welcoming you again the next time you visit Central Florida! Thank you Jorge for an excellent review score. Sorry about the internet a quick call to the office and we could of assisted you. Glad you enjoyed the condo and we look forward to welcoming you again in the future! Best Place I have ever been! My stay was absolutely the best. I walked into a house that looked like a home. Felt at ease and comfortable from minute one. Great communication, safe, close to all attractions and stores. I will be back! Dear David, thank you for an excellent review. 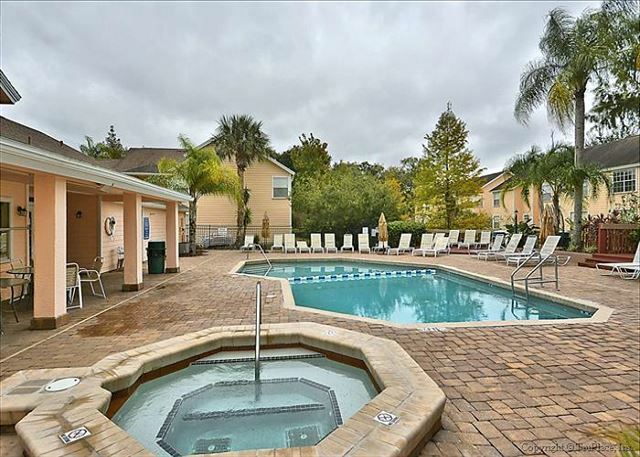 We are glad you enjoyed your stay and look forward to welcoming you again the next time you visit Central Florida! Overall our stay was great. The only negative thing is that the beds were not very comfortable. Phyllis, thank you for your review and feedback. 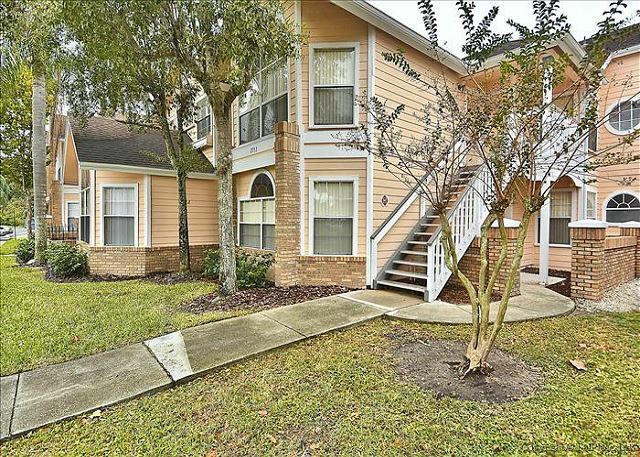 We look forward to welcoming you again next time you visit the Central Florida area! We had good days.O condo is easily accessible, well located, calm.The home was organized but missed object for cleaning, such as bucket, cloth to clean the floor,but fulfilled expectations. Thank you Celso for a great review. Glad you enjoyed this wonderful condo and we look forward to welcoming you again in the future! 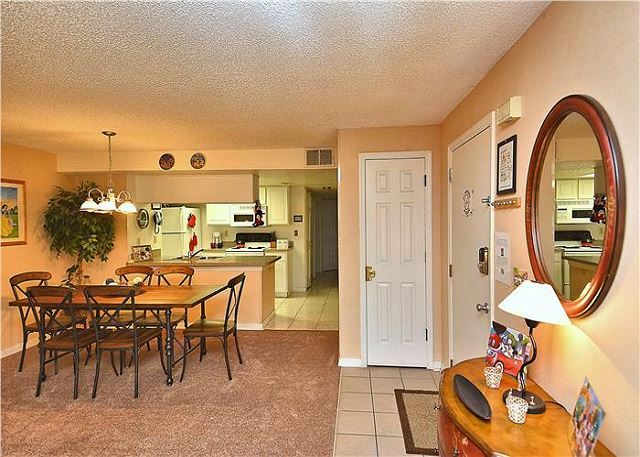 I really enjoyed this condo. 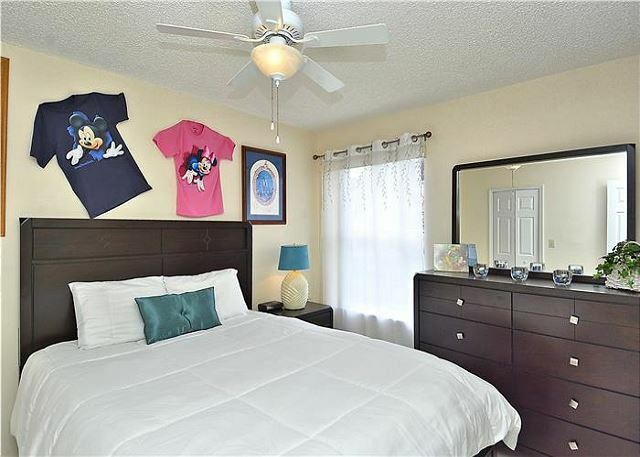 It is very spacious and close to the parks. Great idea to have the key pad and not an actual key to carry around. 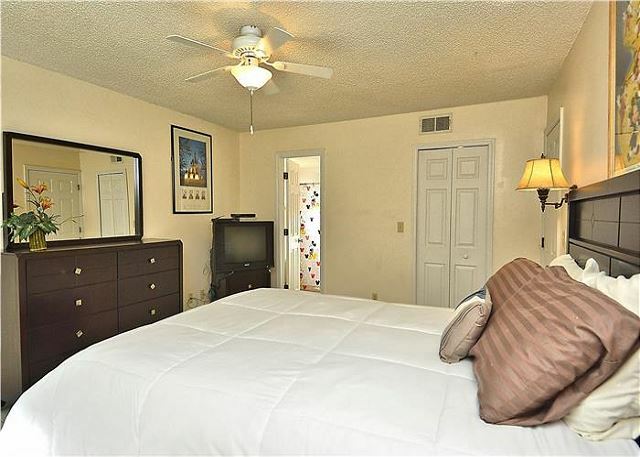 The only complaint is that there were no televisions in two of the bedrooms. I would definitely recommend this particular condo to friends and would stay there again. Thank you Zhohn for an excellent review. Thanks for your feedback about the tv's. 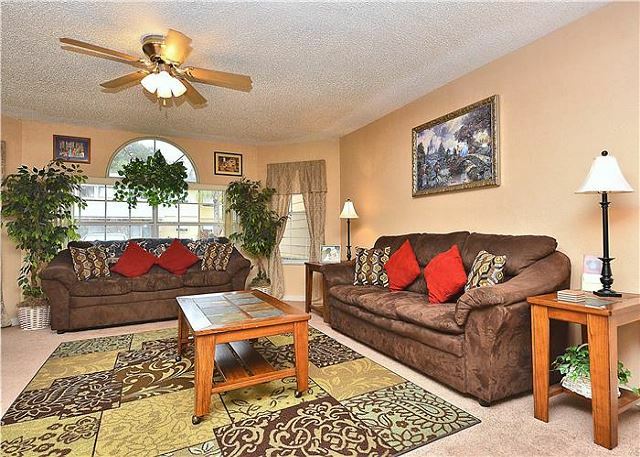 Glad you enjoyed this wonderful condo and we look forward to welcoming you again the next time you visit the area. I enjoyed my stay at the Somerset Retreat. In fact I have already booked it for a month (February 2017) The only concern I have is the mildew/mold? In the bathroom windows. Possibly from humidity in Florida or the lack of a vent in the second bathroom. Hi Connie, thank you for your review and feedback. The bathroom windows have been cleaned and re-caulked. We look forward to welcoming you again next year!! Overall, it was a very clean place. Location is excellent. Close to everything. It was really easy to book and very professionally done. There were a few things that could be improved...the mattresses were not comfortable at all. The sofa was not comfortable either. The water pressure for the shower was terrible. But other than that we were happy. We will definitely be using Excellent Vacation Homes again. Leni, thank you for a great excellent review and your feedback. We look forward to welcoming you again ! This unit is decent. The location for our vacation was perfect. I was very unhappy with the upstairs tenants. They walked heavily and and vaccummed at 3am. The children bounced basketballs at all hours. 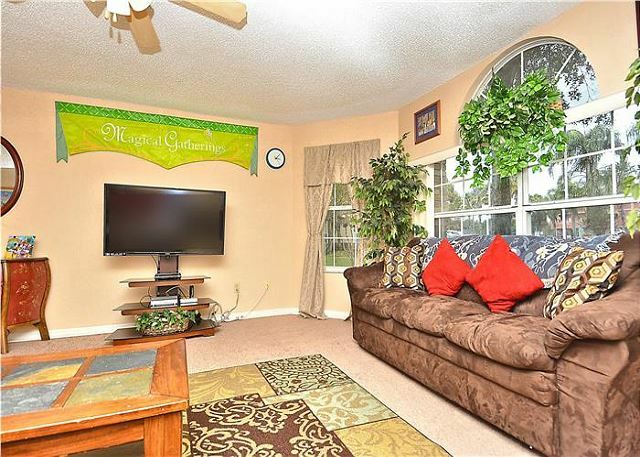 The owners may want to consider new couches. They were very old and uncomfortable. Also, a deep clean of the master bath is needed. There was mold on the window, shower curtain, shower knob and some of the grout. Holly, thank you for the review and feedback. I am sorry the upstairs tenants were loud in the late hours of the night. I hope you enjoyed your stay and look forward to welcoming you the next time you visit the Central Florida area!! Thank you Loretta for an excellent review. 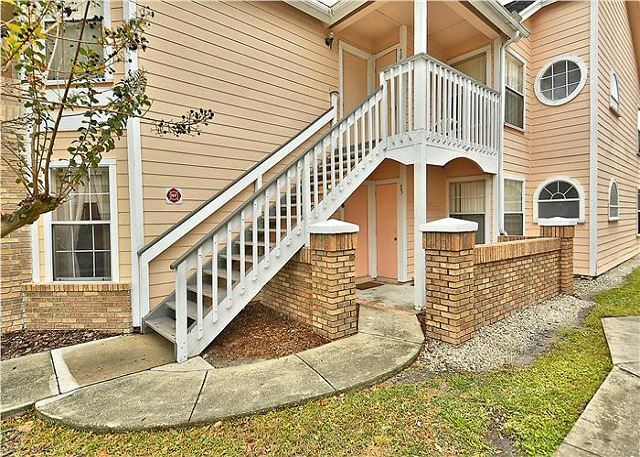 Glad you enjoyed this wonderful condo and we look forward to welcoming you again the next time you visit Central Florida! House was great, perfect vacation! Excellent vacation homes was very welcoming, everything worked out perfectly. Will definitely go back again! Dear Alana, thank you for an excellent review. We look forward to welcoming you again in the future! Great place to stay, but needs cleaning and maintenance. This was a great place to stay overall. 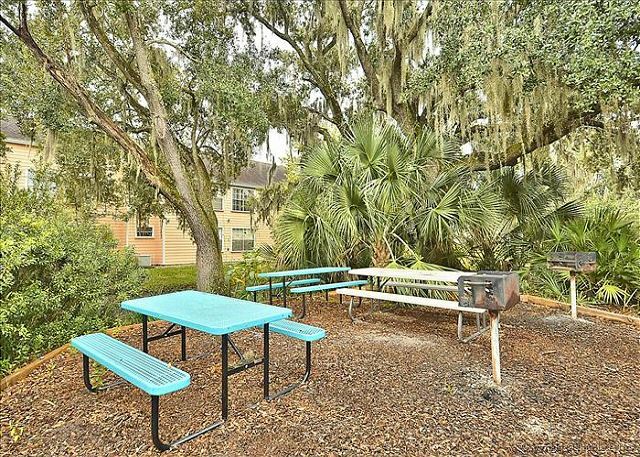 It's in a great location, not far from Fisney Property at all! The condo was kept well overall. However, the biggest negative was that all if the dishes in the cabinets were VERY dusty and needed to be washed before use. Also the door to the laundry room was broken and there were no shower heads in either of the showers. There was also no soap in the condo. Aside from those small negatives, I would definitely recommend this as an affordable, nice place to stay! Dear Ethan, thank you for your review and feedback. We apologize for the dust you found inside the cabinets, that should not have happened. Shortly before your stay this wonderful condo was equipped with new tile floors in the kitchen and hallway, causing quite a bit of cement and grout dust to spread throughout. We did a deep clean right after but obviously missed the inside of the cabinets. This has now been taken care of. Great feedback on the "missing" shower heads; they are definitely there but very small, basic ones, and as a result of your feedback the wonderful owner of this property has agreed to install bigger shower heads. Hand soap bars by the way are always provided so not sure why you did not find them. Unless you are referring to shower soap and/or shampoo (liquid), which is really for the guest to bring. Thank you again for your stay and we look forward to welcoming you again in the future! Sue, thank you for your great review. Overall I'm glad you enjoyed your stay. We look forward to seeing you again in the future!